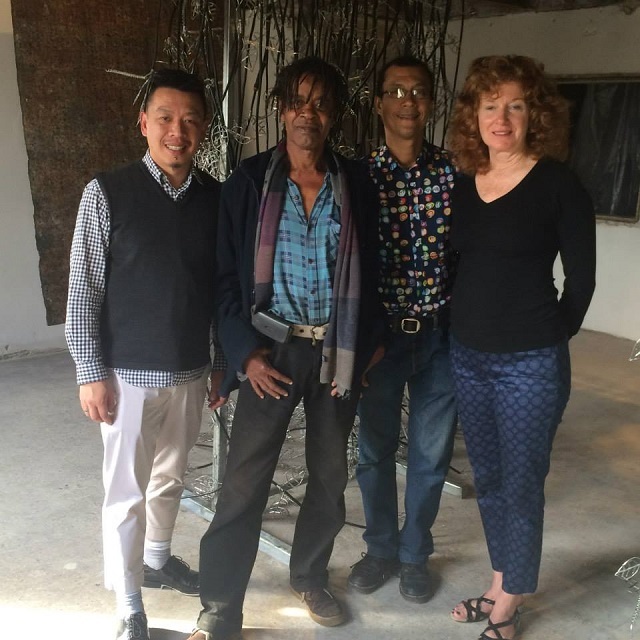 (Seychelles News Agency) - Their artistic creations might still be on display some 7,000 kilometres away from their Indian Ocean island home waiting to be discovered by arts enthusiasts from all over the world, but for Seychellois artists George Camille and Leon Radegonde the mission has been somewhat accomplished. The pair have returned to Seychelles full of enthusiasm and experiences they are eager to share with fellow colleagues after what they have described as “a successful participation” in the 56th Arts Biennale in Venice. This was the small island state of 90,000 people's first participation in the international arts rendezvous which has brought together some 136 artists from 53 countries this year. Camille and Radegonde were chosen out of seven Seychellois artists who responded to the call for participation and consequently submitted their projects. In an interview with SNA, the two artists described how being selected two months after being interviewed by two international curators, Sarah MacDonald and Victor Schaub Wong had generated a mixture of emotions. While both felt very happy to be the first Seychellois chosen to participate in such a prestigious event, they recognised the pressure that the subsequent preparation would bring, with only three months to go before the launching of the biennale. “Going to Venice is not just about you as an artist,” Camille told SNA, adding that he had put everything else on hold. With all participating artists given the task of using their arts to showcase ‘All the world’s futures’, the two Seychellois dug deep into their imagination and creativity merging that with their artistic talents and style to come up with their final product. 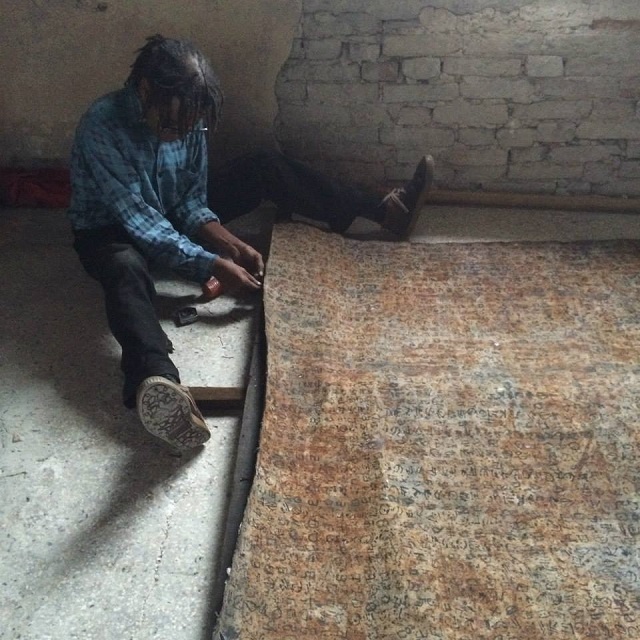 For Camille, he describes his masterpiece titled ‘Lalyann Anvisan’ [in the native creole language], or Creepers, as something he had never done before. The 51-year-old presented an installation depicting the balance between economic development in the tiny archipelago of 115 islands with a population of around 90,000 people and this development's subsequent impact on the environment. 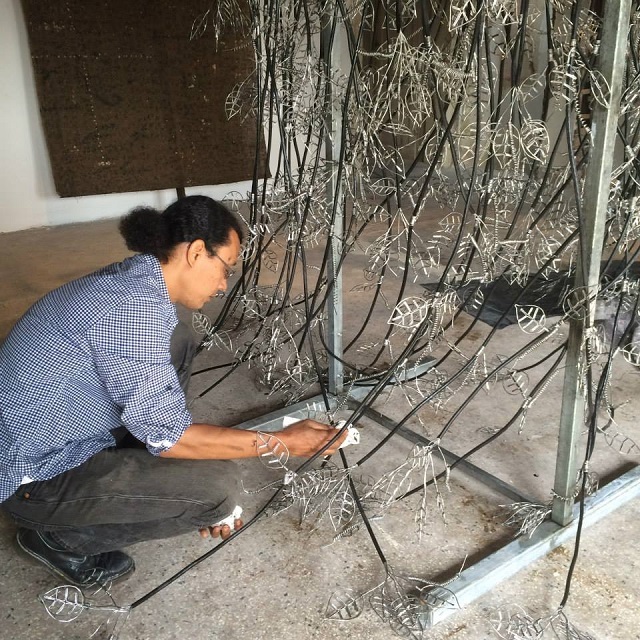 “…an installation of electrical cables, petroleum oil, and metal armatures, which invaded the space as does the uninvited creepers of his native country. The same electric cables used in massive hotel projects on the island are splayed open to reveal the leaf forms of the invasive vines, with tanks of petroleum oil hovering overhead as altars of reverence. 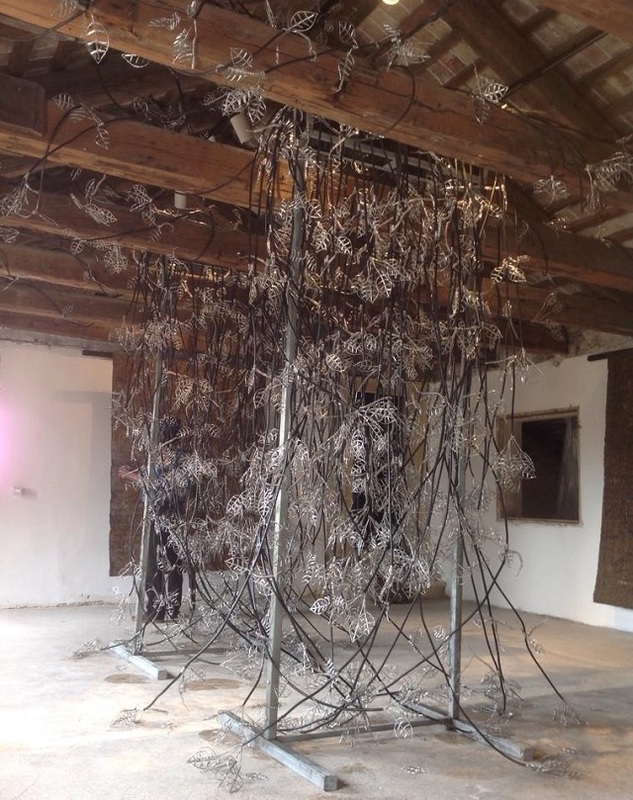 The vines are wrapping around the rafters of the space while the oil is slowing oozing and coating the leaves,” that is how the two curators Sarah MacDonald and Victor Schaub Wong described Camille’s installation, in an article published by eturbo news. For 65-year-old Radegonde, it was more of a paint-on-canvas affair, portraying his memories and experiences from childhood. “The resulting time capsules serve as a catalyst to forge forward into the future. Out of his dark canvas a new light is emitted,” described the curators. The artworks of the Seychellois artists are on display in a fifty square metre space at the 'Palazzo Mora', a cultural centre that hosts art and architecture exhibitions which they obtained for free, thanks to what they have described as generous sponsors. Apart from the Seychelles pavilion dubbed ‘A Clockwork Sunset’, the Philippines’ and Mongolia’s pavilions are also located at the Palazzo Mora. 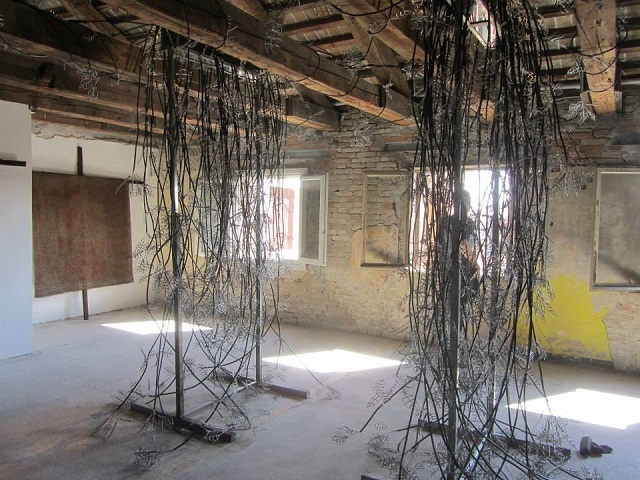 Camille and Radegonde admitted that they were only able to collect 15,000 Euros for their participation in the Venice Biennale; quite a substantial amount for artists from the small Indian Ocean archipelago. “To have a good pavilion…you need to have support. Some countries have enormous spaces to exhibit, with some having a whole building for themselves, all because of the financial resources available,” they told SNA. Nevertheless, the pair did not allow their lack of funding to discourage them, but instead found ways to adapt and make optimal use of the space they had been allocated. “Our exhibition had cohesion, the quality of the art was good and it was nicely presented in the ‘Palazzo’. Everything considered, I’m happy with it, I’m proud of it and for me it’s a good point of departure and we can only build on it,” said Camille. The opening of the biennale on Saturday May 9 saw a good number of Seychellois and friends of the artists residing in Europe who had come to give their support as well as the Seychelles Minister for Tourism and Culture Alain St. Ange. Both artists are of the view that through the Seychelles pavilion, the island nation, which is first and foremost a tourism destination, was able to attract a lot of visibility as the artists managed to feature in various press interviews and subsequent publications. “…all things considered, we are happy with what we have presented… we stood our ground,” said Radegonde. 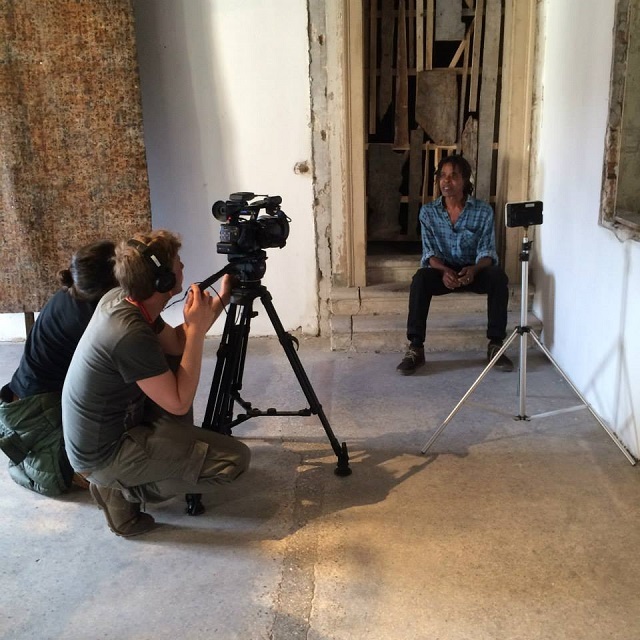 “As a result Seychelles has generated a lot of interest in terms of the country and the art, and from now until the 22nd of November, when the Biennale will come to an end, a lot of people are going to hear about Seychelles, even though not all of them will be visiting the exhibition itself,” affirmed both artists. For the arts in Seychelles, the two are of the opinion that their participation has only paved the way for a better and bigger participation of a larger number of Seychellois artists in future Venice Art Biennales. Seychelles was one of five countries participating in the biennale for the first time alongside Indian Ocean neighbour of Mauritius, Grenada, Mongolia and Mozambique. The event has also had an impact on the individual artists, in that they are now both either re-examining or re-considering their artistic creations to adapt to what they have gained in terms of experience. “I thought I had completed my collection, but now I realise I need to add on to it to make it more substantial, to think bigger in terms of both content and quality,” Radegonde told SNA. For George Camille, the Venice Arts Biennale was a 'déjà vu' experience - not in terms of participating, but having had the chance to visit six previous biennales as a spectator. Both artists are also planning to meet up with fellow local visual artists to share their experiences. “It is important to put contemporary international art on the forefront so people can see that art can be a career, art can take you that far and you can earn a living as an artist as internationally artists are respected,” said Camille. This he said might change the perception of many Seychellois parents in terms of encouraging their children to study art and taking it as a career. The Venice Art Biennale will remain open until Sunday November 22, after which Camille and Radegonde are hoping to re-exhibit their work in Seychelles.